104 B.C. - 44 B.C. 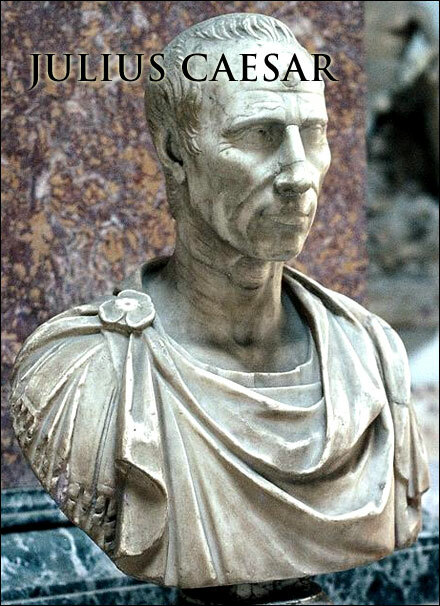 Julius Caesar may not be technically referred to as the first "Emperor" of Rome, but he began a dynasty that would rule the Roman Empire for a hundred years. In 44 B.C. 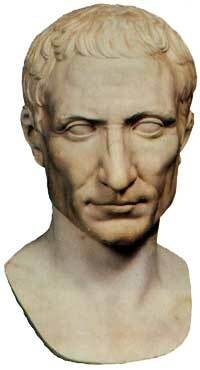 the Senate bestowed upon him the title of "Imperator" which is where the word "emperor" originates. Though he was acting as dictator, he would not allow himself to be referred to publicly as king or emperor but "Caesar" instead. He was assassinated in 44 B.C. by some of his close friends, including Brutus on the Ides of March, the 15th. 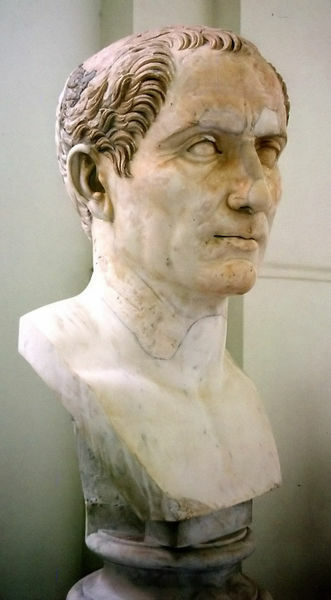 This sketch of the portrait bust at Museo Archeologico Nazionale di Napoli was copied from the University Of Texas Library Portrait Gallery, by H.F. Helmolt (ed. ): History of the World. New York, 1902. He was a Roman General famous for conquering Gaul (now France and Belgium) and his subsequent coup d'Ã©tat. 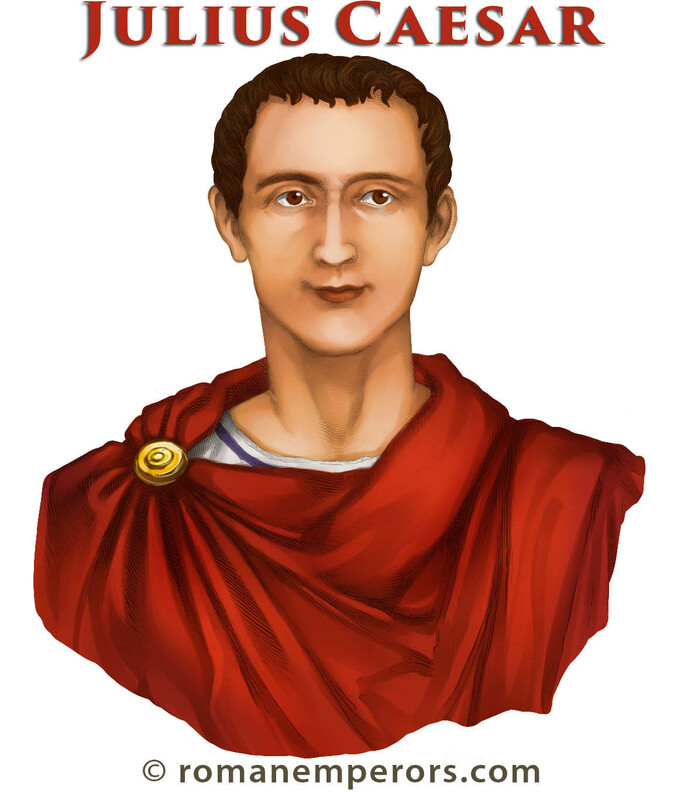 He changed the Roman Republic into a monarchy thus his sole heir was Gaius Octavian, the first Emperor of Rome. This was the first known public rendition of Julius Caesar that is totally lifelike. His portraiture represents a strong character; he was indeed a brilliant leader. The bust is on display at archaeological national museum, Napoli. 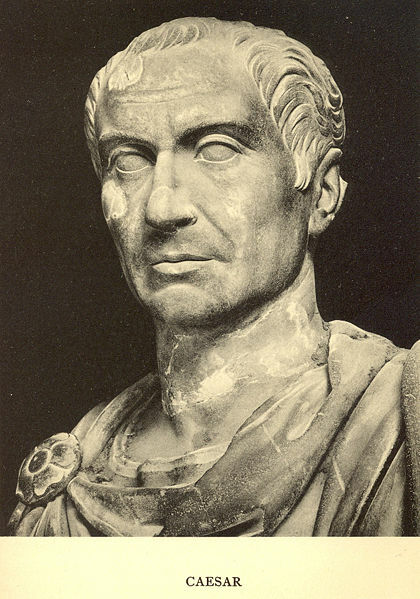 Julius Caesar was a man of great stature that was able to change the history of Rome. 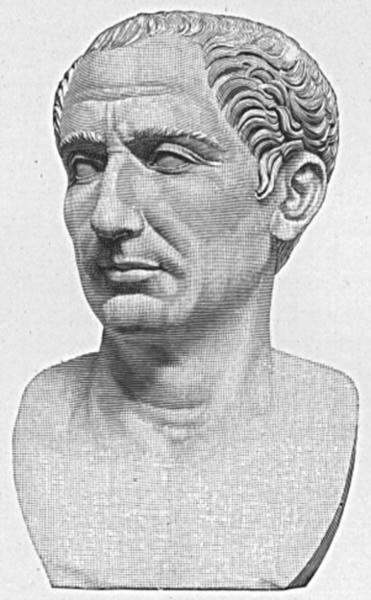 The source of the image is form George Willis Botsford, A History of Rome, McMillan, 1921 and the bust itself is from British Museum. 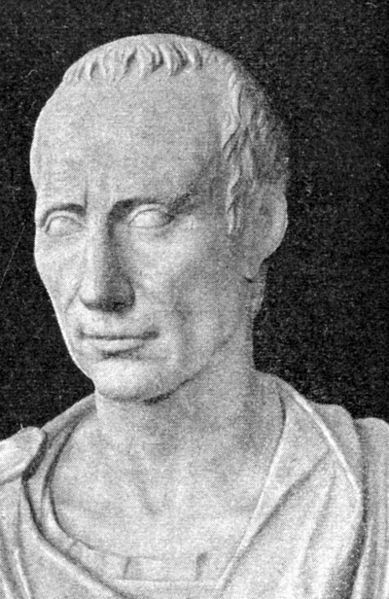 Julius Caesar was almost bald, as the sculpture depicts, and with a dark skin complexion. 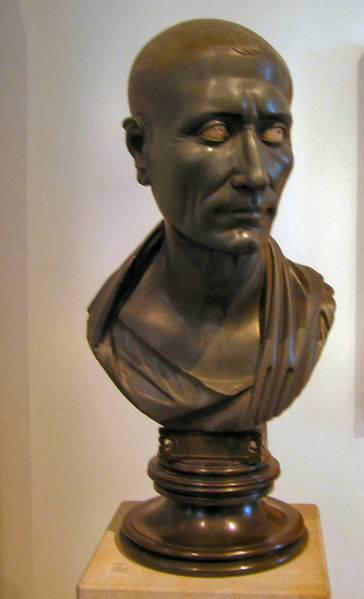 According to Suetonius, "He was embarrassed by his baldness, which was a frequent subject of jokes on the part of his opponents; so much so that he used to comb his straggling locks forward from the back, and of all honours heaped upon him by senate and people, the one he most appreciated was to be able to wear a wreath at all times..." The bust is on display at Altes Museum, Berlin. The source of the photo was remastered from Alfred von Domaszewski Geschichte der Romischen Kaiser Verlag von Quelle & Meyer in Leipzig 1914. He was the first dictator of Rome and the one who befriended the Jews by helping them spread the gospel. Christians were treated as a Jewish sect; they were allowed to meet just as Jews were allowed their synagogues. The bust is on display at the Art History Museum, Vienna, Austria. 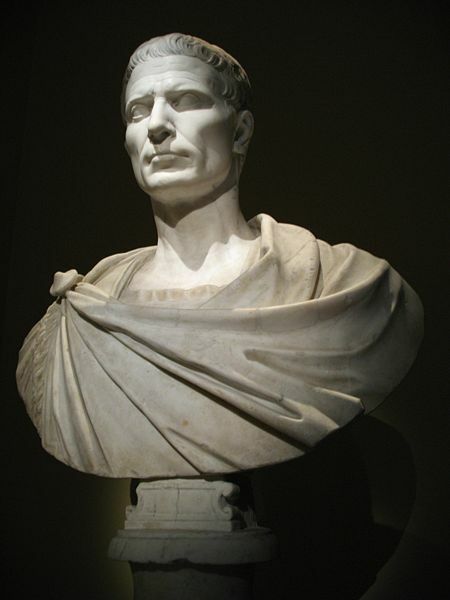 Julius Caesar was one of the most influential men in world history. 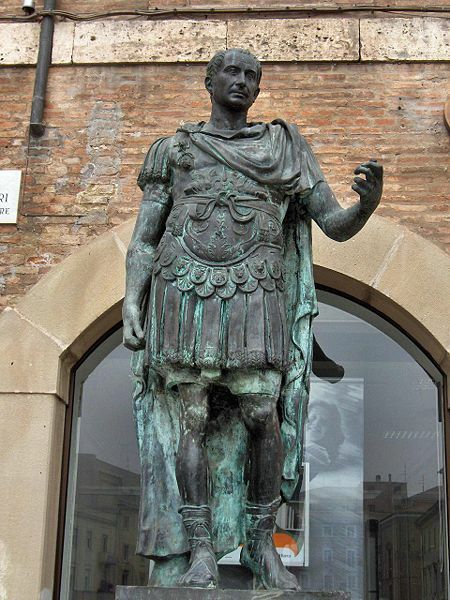 He was known for his role in transforming the Roman Republic into a Roman Empire. This modern statue can be seen in Rimini, Italy. This coin was minted in Italy around 49 BC. 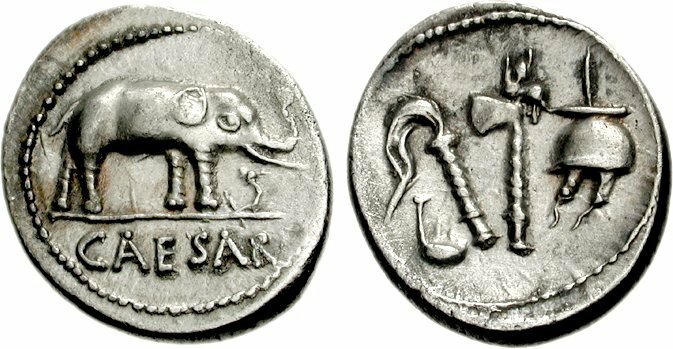 On the obverse is an elephant walking and trampling on a horned serpent. 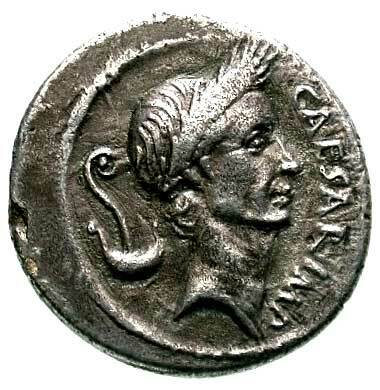 Below that is the emblem "CAESAR" and on the reverse are culullus, aspergillum, axe and apex. Laureate head of Julius Caesar can be seen on the left part of the images, while on its opposite are cornucopia on globe, rudder on left, caduceus and apex are emblem. 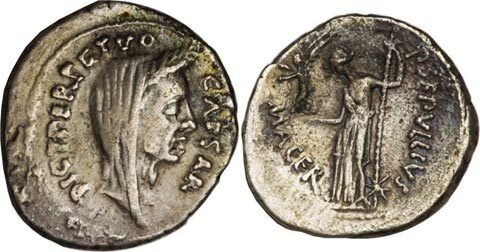 Julius Caesar Denarius with the Head of Venus wearing a crown as a sign of royalty is on the left. On its right is the Trophy of Gallic arms with seated captives at either side of base, with "CAESAR" below as emblem. Laureate and veiled head of Caesar is on the left, and on the right is Venus, the goddess of beauty and love, standing and holding Victory and scepter set on star. 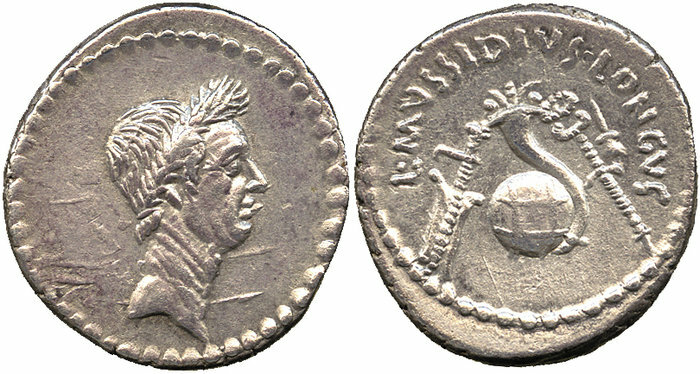 Wreathed head of Julius Caesar on the obverse and behind him is the lituus and simpulum. On the reverse is Venus resting her elbow on a rounded shield set on globe holding Victory and a scepter. The wreathed and veiled head of Julius is on the left portion of the image. On the reverse is an emblem "C COSSVTIVS", "MARID-IANVS" and "AAN A A FF". It was minted in Rome in 44 BC. 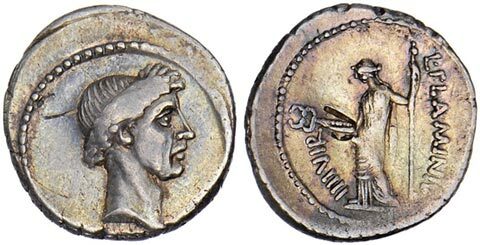 Bare head of Mark Antony is on the obverse (Front) and on the reverse is the wreathed head of Julius Caesar. 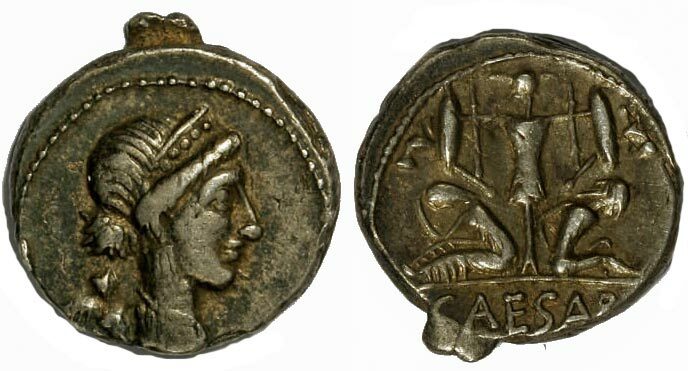 This coin was military minted by the person traveling with Antony in Cisalpine, Gaul. 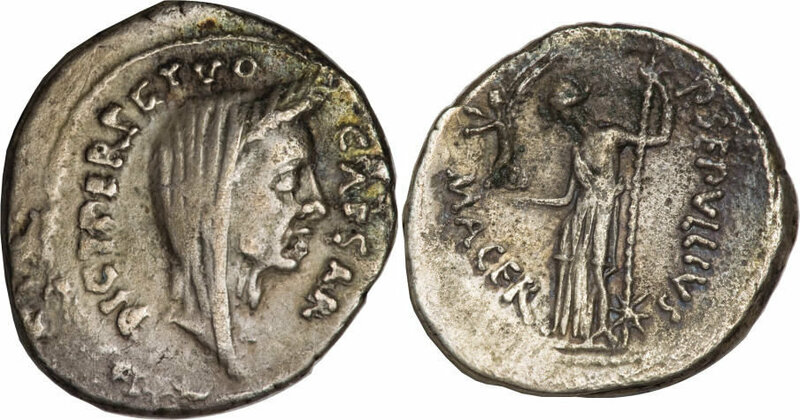 On the obverse are the heads of Julius Caesar and Octavian back to back, and a prow on the reverse side. Julius Caesar with Pax the Goddess of Peace. 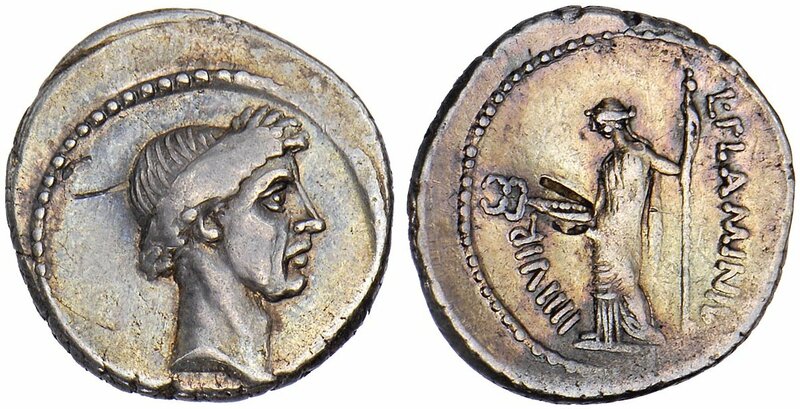 Posthumous coin of Caesar bearing his wreathed head with no inscriptions or emblems. Opposite is Pax, the goddess of peace holding the caduceus and scepter. 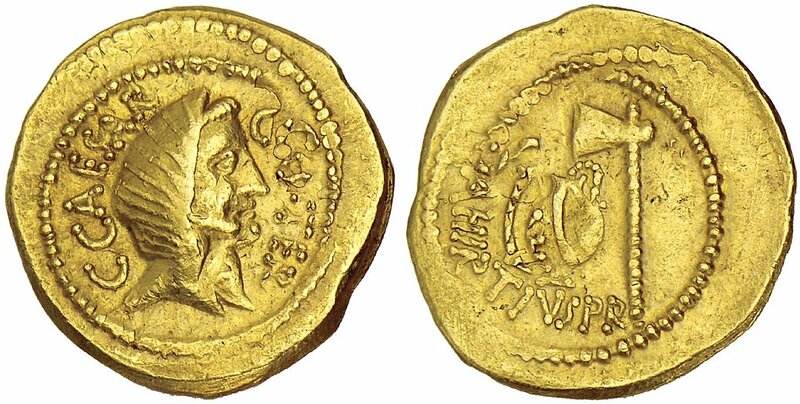 This gold coin reveals the veiled head of Julius Caesar on the front side with emblem "CAESAR COS TER". 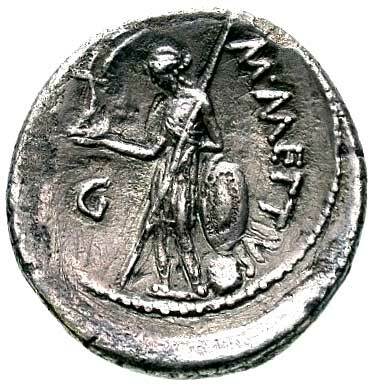 At the back of the coin is a lituus, a jug and an axe with emblem "A. HIRTIVS P.R".